Family-to-Family is a 12 week education class, for the family members of someone living with a mental health disorder. Classes are 2.5 hours long and cover a variety of topics including understanding diagnosis, coping skills, medications, communication and more. Classes are held near Loma Linda. Classes are free of charge and open to the adult (over 18) Family Members of indiviuals living with a mental health disorder. Although membership is not required, we encourage all family members to become NAMI San Bernardino Members. ​Es un programa de 12 sesiones para familiares ADULTOS, amigos y seres queridos de adultos que viven con una enfermedad mental. El curso está diseñado para ayudar a la familia a comprender y apoyar a sus seres queridos que viven con un trastorno mental, sin descuidar el bienestar del círculo familiar. El curso incluye información sobre trastornos mentales como la esquizofrenia, el trastorno bipolar y la depresión grave, entre otros. Miles de familias describen el programa como una experiencia que ha cambiado sus vidas. Laclase es libre de asistir. NAMI Peer-to-Peer is an 8-session recovery-focused course for adults with mental health conditions. The classes are Free and confidential and held once a week for two hours, for 8 weeks. Classes will be held Saturday mornings at 10 a.m in Redlands. Class size is limited. Please register by going to the contact button at the top of the page and submitting your name, phone and email address. We will contact with details of location and start date . Class size is limited, preregistration is required. For more information about NAMI Peer-to-Peer classes click here. NAMI Homefront is a free, 6-session educational program for families, caregivers and friends of military service members and vets with mental health conditions. Based on the nationally recognized NAMI Family-to-Family program, NAMI Homefront is designed to address the unique needs of family, caregivers and friends of those who have served or are currently serving our country. The program is taught by trained family members of service members/veterans living with mental health conditions. Now offered online! We understand that attending an in-person class can be difficult for busy individuals and families. We now offer NAMI Homefront Online. Online classes meet weekly in a virtual classroom, so participants experience the same level of interaction and learning as traditional in-person classes. ​Registration in now open for the online sessions. For more information about NAMI Homefront on-line, and to register click here. 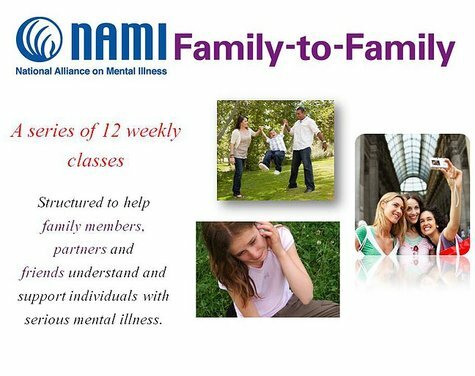 NAMI Basics is a free, six-session, program designed for parents and other family caregivers of children and adolescents with emotional and behavioral difficulties. NAMI Basics helps parents and other family caregivers of children to understand the illnesses that are causing those behavioral difficulties, and the critical role families play in the treatment of those illnesses. The program is taught by trained teachers who are also the parents or family caregivers of individuals who experienced emotional or behavioral difficulties prior to age 13. Register now! Class begins May 1, 2019 at 6pm in a convenient location in Loma Linda. Please register by using the contact at the top right side of the page. Attention: Basics, please include: your name(s), a phone number and email address so we can contact you, your relationship to the child/teen with the Mental Health issue and their age. We will contact you with details and location. Class Size is Limited! For more information about NAMI Basics click here.